Glass recycling is simple because glass is one of the easiest materials to recycle. Furthermore, almost all municipal recycling centers and curbside recycling programs accept glass. For a large number of South Africans all that is needed is to, drop off empty glass containers at a nearby collection point or in some cases carrying recycling bins to the curb. The most challenging part about recycling glass is that you might need to separate different colour glasses to maintain cullet (crushed glass) uniformity. Recycling glass is sustainable because glass is 100-percent recyclable. This means that glass can be recycled again and again and it will not loss the purity or quality in the glass. Glass is the main ingredient in all new glass containers therefore recycling glass makes making it more efficient. 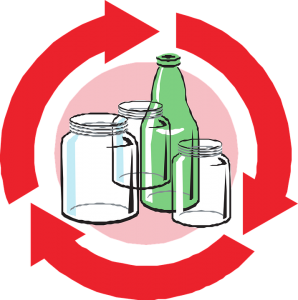 Typically, new glass containers are made of approximately 70 % of recycled glass. It is estimated that, 80% of all recycled glass will eventually end up as new glass containers. Recycling glass saves energy by not needing to make new glass. New glass is made by heating sand and other substances to a temperature of 2,600 degrees Fahrenheit. This process creates a lot of industrial pollution, uses up a lot of energy and produces greenhouse gases. Step one in the glass recycling process is to crush the glass and create cullet. Reducing glass products into cullet and making new glass containers this way consumes 40% less energy than making new glass from raw materials. This is due to the fact that cullet melts at a much lower temperature. Yep, that’s right it pays which is extra incentive to recycle glass. In South Africa buy-back centers offer cash refunds for most glass bottles. Approximately 50 000 active glass collectors in South Africans collect and sell glass buy-back centres for extra money. With all the benefits of recycling glass why not start recycling today. At Shades Of Ngwenya we are passionate about all things glass. Visit our website today.